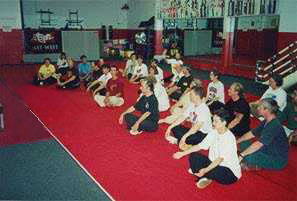 Our spacious facility is large and comfortable with over 5,000 square feet divided into three main training areas. One space has a state of the art cushioned floor, while the other two have wood floors. We also have mirrored walls, private changing rooms, and a pro-shop for books, videos, weapons, clothing and more. Below are some pictures of our school murals. 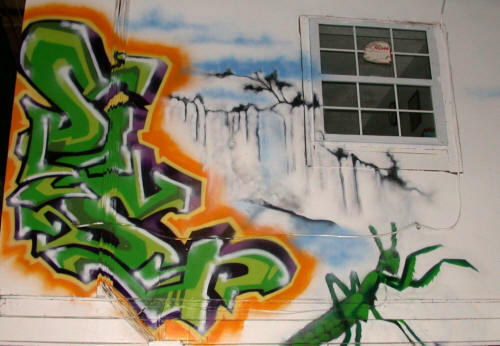 These were painted by Fly I.D., a talented group of graffiti artists, who have become well known for their charitable and community-based projects, in addition to their work for private businesses and organizations. You can contact Fly I.D. at flysiek@earthlink.net. Scroll through the thumbnail pictures and click on them to view full size.